On January 23, 2009, a movie called Inkheart which was based on the top-selling novel by Cornelia Funke burst its way onto unsuspecting audiences and now comes to Warner Bros Blu-ray this June. Mo Folchart (Fraiser) drags his daughter Meggie (Bennet) all around the world. At the last home, an old enigmatic acquaintance of Mo's named Dustfinger (Bettany) shows up. All of a sudden the next morning, Mo packs up and leaves with Meggie without telling her what is going on. They travel to Meggie's Great Aunt Eleanor's (Mirren) house and stay there. Then one night, a bunch of thugs arrive at the house and kidnap Mo to take him to see Capricorn (Serkis), a cruel and evil dictator. Meggie soon finds out that Mo has the ability to read characters out of books. The only drawback is that when he brings something out of a story, something must go back in to replace it. This is how Meggie lost her mother Theresa (Guillory), and Capricorn and Dustfinger are characters from a book called, Inkheart. Determined to get Mo back, Meggie sets out with Eleanor to Capricorn's Village. However, in short of arriving there, both women are also abducted and locked up with Mo. Dustfinger soon comes to the rescue and smuggles them out with a boy named Farid (Gavron), who also came out of a book. Now the Group of them must find away to get another copy of Inkheart to send Capricorn and his thieves back into its pages. With the novel by Cornelia Funke is world renowned the director, Lain Softley made sure to pay careful attention to her work and even had her come on the set to oversee the transformation of her world onto the silver screen. The story is simply captivating and bring to life all of the characters you have only read or seen in the universe -- now all in the same film, such as Toto, the Twister, and flying monkey's from the Wizard of Oz, the crocodile from peter pan, and characters straight out of the 40 thieves. What really makes this film shine and come to life, is the superb cast that Lain Softley has brought together for the film -- including such great actors as Brendan Fraser, Sienna Guillory, Eliza Bennett, Paul Bettany, Helen Mirren, Rafi Gavron, and Andy Serkis. The one true outstanding performance is relative newcomer Eliza Bennett. Her acting skills and presence is simply amazing on screen, and she definitely has a long acting career ahead of her. As with most transfers coming from Warner Bros Home Entertainment, this one is simply amazing. Warner Bros continually shows its commitment to the format with these top-notch discs. The video itself is encoded with the VC-1 encoder in stunning 1080p. The picture is simply amazing with no artifacting at all and shows the landscape of Europe almost as if you are actually there. The audio is presented in Dolby True HD 5.1 and is simply phenomenal and provides the full range of audio in the great dynamic scenes to the action and special effects laden ones. 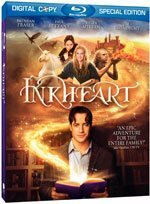 To round things out, Inkheart also contains a few behind the scenes features and as well as a DVD copy of the film along with the normal Digital copy so you may take it on the go to keep you entertained while away from your home theater. Inkheart is a great piece of cinema action and while it will not win any academy awards, it is a great film for the entire family to enjoy together. Download Inkheart from the iTunes Store in Digial HD. For more information about Inkheart visit the FlickDirect Movie Database.